Learn Automation & Become an Expert in Automation! 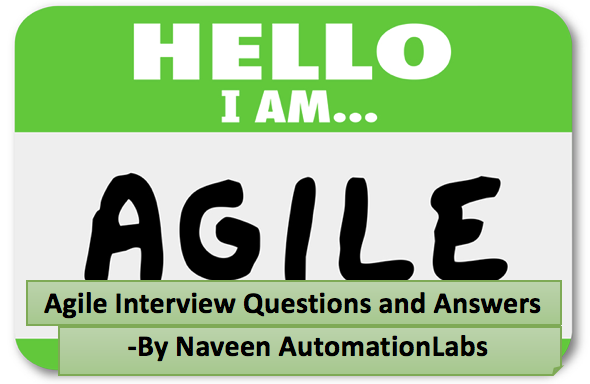 Agile Testing Interview Questions and Answers will help you prepare for Agile methodology and agile process interviews for testers or developers. Q#1. What is Agile Testing? Ans. Agile Testing is a practice that a QA follows in a dynamic environment where testing requirements keep changing according to the customer needs. It is done parallel to the development activity where testing team receives frequent small codes from the development team for testing. Q#2. What is the difference between burn-up and burn-down chart? Ans. Burn-up and burn-down charts are used to keep track the progress of the project. Burn-up charts represent how much work has been completed in any project whereas Burn-down chart represents the remaining work in a project. Q#3. Define the roles in Scrum? 1 Project Owner – who has the responsibility of managing product backlog. Works with end users and customers and provide proper requirement to the team to build the proper product. 2 Scrum Master – who works with scrum team to make sure each sprint gets complete on time. Scrum master ensure proper work flow to the team. 3 Scrum Team – Each member in the team should be self-organized, dedicated and responsible for high quality of the work. Q#4. What is Product backlog & Sprint Backlog? Ans. Product backlog is maintained by the project owner which contains every feature and requirement of the product. Sprint backlog can be treated as subset of product backlog which contains features and requirements related to that particular sprint only. Q#5. Explain Velocity in Agile? Ans. Velocity is a metric that is calculated by addition of all efforts estimates associated with user stories completed in a iteration. It predicts how much work Agile can complete in a sprint and how much time will require to complete a project. Q#6. Explain the difference between traditional Waterfall model and Agile testing? Ans. Agile testing is done parallel to the development activity whereas in traditional waterfall model testing is done at the end of the development. As done in parallel, agile testing is done on small features whereas in waterfall model testing is done on whole application. Q#7. Explain Pair Programming and its benefits? Ans. Pair programming is a technique in which two programmer works as team in which one programmer writes code and other one reviews that code. They both can switch their roles. 1 Improved code quality: As second partner reviews the code simultaneously, it reduces the chances of mistake. 2 Knowledge transfer is easy: One experience partner can teach other partner about the techniques and codes. Ans. Modification of the code without changing its functionality to improve the performance is called re-factoring. Q#9. Explain the Iterative and Incremental Development in Agile? Ans. Iterative Development: Software is developed and delivered to customer and based on the feedback again developed in cycles or release and sprints. Say in Release 1 software is developed in 5 sprints and delivered to customer. Now customer wants some changes, then development team plan for 2nd release which can be completed in some sprints and so on. Incremental Development:Software is development in parts or increments. In each increment a portion of the complete requirement is delivered. Q#10. How do you deal when requirements change frequently? Work with PO to understand the exact requirement to update test cases. Also understand the risk in changing the requirement. Apart from this one should be able to write generic test plan and test cases. Don’t go for the automation until requirements are finalized. Q#11. What is a test stub? Ans. A small code which mimics a specific component in the system and can replace it. Its output is same as the component it replaces. Q#12. What qualities should a good Agile tester have? 1 Agile tester should be able to understand the requirements quickly. 2 Agile tester should know Agile concepts and principals. 3 As requirements keep changing, he should understand the risk involve in it. 4 Agile tester should be able to prioritize the work based on the requirements. 5 Communication is must for a Agile tester as it requires a lot of communication with developers and business associates. Q#13. What is difference between Epic, User stories & Tasks? Ans. User Stories:User Stories defines the actual business requirement. Generally created by Business owner. Task: To accomplish the business requirements development team create tasks. Epic: A group of related user stories is called an Epic. Q#14. What is a Task board in Agile? 1 User Story: which has the actual business requirement. 2 To Do: Tasks that can be worked on. 3 In Progress: Tasks in progress. Q#15. What is Test Driven Development (TDD)? Ans. It is Test-first development technique in which we add a test first before we write a complete production code. Next we run the test and based on the result refactor the code to fulfill the test requirement. Q#16. How QA can add a value to an agile team? Ans. QA can provide a value addition by thinking differently about the various scenarios to test a story. They can provide quick feedback to the developers whether new functionality is working fine or not. Q#17. What is Scrum ban? Ans. It is a software development model which is combination of scrum and kanban. Scrumban is considered for maintenance projects in which there are frequent changes or unexpected user stories. It can reduce the minimum completion time for user stories. Q#19. What is Zero sprint in Agile? Ans. It can be defined as pre step to the first sprint. Activities like setting development environment, preparing backlog etc needs to be done before starting of the first sprint and can be treated as Sprint zero. Ans. There may be some technical issues or design problem in the project which needs to be resolved first. To provide the solution of these problem “Spikes” are created. Spikes are of two types- Functional and Technical. Q#21. Name some Agile quality strategies. Q#22. What is importance of daily stand up meeting? 1 Team discuss about how much work has been completed. 2 What are the plans to resolve technical issues. 3 What steps need to done to complete the projects etc. Q#23. What is tracer bullet? Ans. It can be defined as spike with the current architecture or the current set of best practices. The purpose of a tracer bullet is to examine how an end-to-end process will work and examine feasibility. Q#24. How the velocity of sprint is measured? Hope these questions will help you in preparing for agile testing and methodology interview. Is this enough for preparing for any interviews wrt agile? Thank you for the nice article here. Really nice and keep update to explore more gaming tips and ideas. How To Upgrade from Selenium RC To WebDriver?